The National Hurricane Center upped the winds to 125 mph to agree with our previous estimate. We still think that Norbert is a little stronger. We'll go with 130 mph at this point - bordering on a cat 4 hurricane. 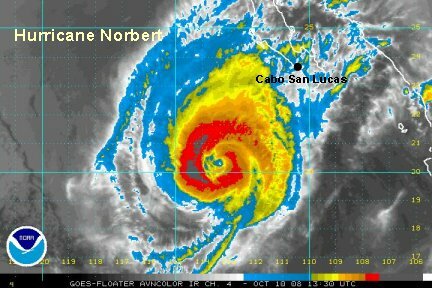 Norbert is centered at 16.5 N / 110.9 W or about 440 miles south of Cabo San Lucas. 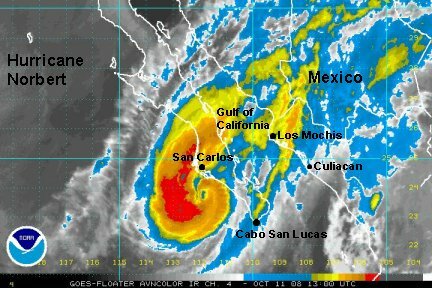 It is time to make preparations to protect lives and property on the southern Baja for a potentially strong hurricane! NHC has upped the winds to 135 mph. Norbert is officially a cat 4. At 11:45 pm pdt (2:45 am edt) Hurricane Norbert is centered at 17.2 N / 112.1 W or about 410 miles ssw of Cabo San Lucas. It has now ingested a bit of dry air on the southeastern side of the circulation, because of this the circulation looks weaker. Cloud tops in the eyewall have warmed too on the southeast side. We think a good estimate of the top sustained surface winds are now 125 mph. Norbert is starting to move more northwest. It will then northeast by Friday. It could be close to the southern Baja by Friday night or early Saturday. It will be getting closer to cooler ocean water and stronger winds aloft. These two features will weaken Norbert before landfall. Interests along the southern Baja and northwest Mexico should continue to follow Norbert. It is time to make preparations to protect lives and property on the southern Baja for a potentially a cat 1 or 2 hurricane! It may arrive on the eastern side of the Gulf of California Saturday as a tropical storm. Norbert is officially now at 115 mph. This looks reasonable as the weakening trend continues. It is still a minimal cat 3 hurricane at this time. Dry air is still seen on the southeast side of the circulation and is disturbing the circulation some. Norbert is centered about 385 miles ssw of Cabo. Look for high swell on the southwest side of the southern Baja. Swell could be in the 10-15' range. Large swell will also affect the northwestern coast of Mexico, but not as high as the southern Baja. Norbert is moving northwest at 7 mph. It will soon turn northeast by tomorrow. It could be close to the southern Baja by Friday night or early Saturday. It will be getting closer to cooler ocean water and stronger winds aloft. These two features will weaken Norbert before landfall. Hurricane Norbert is "feeling" the trough to the north and now has slowed and turned north. It is moving north at around 6 mph, with a few wobbles over the past few hours. Norbert is centered at 18.3 N / 112.8 W or about 320 miles ssw of Cabo. 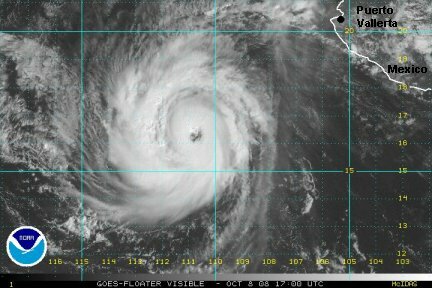 Dry air has disrupted the circulation, so we'll estimate that the top sustained surface wind in now about 105 mph, down from 115 mph. Look for high swell on the southwest side of the southern Baja. Swell could be in the 10-15' range. Large swell will also affect the northwestern coast of Mexico, but not as high as the southern Baja. Norbert will turn northeast by tomorrow. It could be close to the southern Baja by Friday night or early Saturday. It will be getting closer to cooler ocean water and stronger winds aloft. These two features will weaken Norbert before landfall. A hurricane hunter found some weaker winds and NHC has dropped the winds to 90 mph. Satellite imagery continues to show some weakening, so this is reasonable. Hurricane Norbert is looking a little more organized on the satellite imagery again. The dry air that disturbed the circulation has now faded some. We'll estimate that Norbert is about 95 mph. A microwave estimate came in a short while ago that was considerably higher. We're going with a conservative approach this time, since the strengthening should be temporary. At 11:30 pm pdt (2:30 am edt) Norbert is centered near 19.3 N /113.4 west or about 325 miles ssw of Cabo San Lucas. It is moving nnw at around 9 mph. One of the outer rain bands is just south of Cabo San Lucas. The worst of the weather remains well offshore. Interests along the southern Baja and northwest Mexico should continue to follow Norbert. It is time to make preparations to protect lives and property on the southern Baja for possibly a cat 1 hurricane. Landfall appears to be late Friday night or Saturday morning on the southwest Baja north of Cabo. At 7:30 am pdt (10:30 am edt) Norbert is centered near 20.2 N /113.6 west or about 290 miles ssw of Cabo San Lucas. It is moving nnw at around 8 mph. Norbert is almost moving due north over the past couple of hours. We still still disagree with the hurricane center on the strength. Cloud tops have cooled way down and the CDO structure looks better than yesterday. NHC officially has 85 mph and a forecast to decrease. We say top sustaned winds are back to 105 mph. Look for NHC to bump their estimate up on their next advisory. Preparations to protect liives and property should be completed by this afternoon. Landfall appears to be late Friday night or Saturday morning on the southwest Baja north of Cabo. Norbert has been on a strengthening phase today. The eyewall has thickened and cloud tops have cooled. Our estimate of top sustained surface winds are now 115 mph. The hurricane center upped their winds from 85 to 100 mph on there last advisory to come close to our estimate. 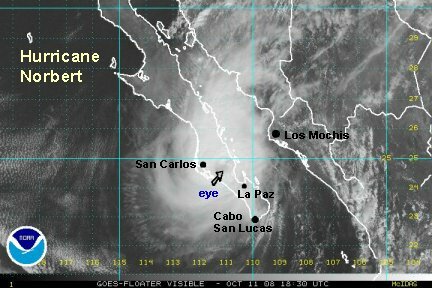 Hurricane Norbert as of 12:15 pm pdt (3:15 pm edt) is centered near 20.8 N / 113.7 W or about 275 miles southwest of Cabo San Lucas. It is moving north at 8 mph. Preparations to protect liives and property should be completed by this afternoon. Landfall appears to be Saturday morning on the southwest Baja north of Cabo near San Carlos. The worst of the conditions will be near and south of the landfall point with respect to storm tide flooding. Hurricane Norbert is now acclerating northeast toward the southwest Baja. It should make landfall Saturday morning near San Carlos. The worst of the condition will be near and to the south of landfall. As of 6:30 pm pdt (9:30 pm edt) Norbert was centered near 22.0 N / 113.3 W or about 215 miles wsw of Cabo San Lucas. The upper trough is increasing wind shear over Norbert. The eyewall still has very deep convection, but is being stretched out. Our estimate is now 105 mph, down from 115 mph earlier. Officially NHC had 105 mph earlier. 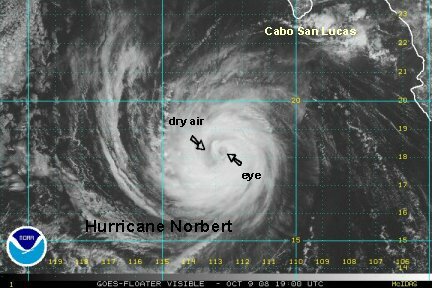 It is likely that Norbert will make landfall as a cat 1 or cat 2 hurricane. The 12 hour strengthening period from earlier today appears to be from a significantly warmer pool of water that it crossed. Water temperature are cooler near the coast and much more significantly, wind shear will increase. We fully expect Norbert to weaken more before landfall, but still in the cat 1/2 range. Large southwest swell will batter the coast. Swell may be 20' or more near and south of landfall. Rainfall amounts may be 5" or more. Norbert will weaken as it makes landfall but may still may be a strong tropical storm for its second landfall on the eastern side of the Gulf of California late Saturday. Hurricane Norbert is now accelerating nne toward the southwest Baja. It should make landfall Saturday mid-morning near San Carlos. The worst of the conditions will be near and to the south of landfall. 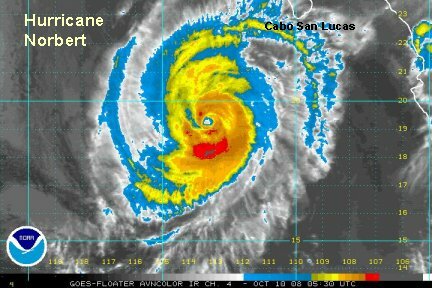 As of 11:45 pm pdt (2:45 pm edt) Norbert was centered near 22.8 N / 112.8 W or about 180 miles west of Cabo San Lucas / 150 miles sw of San Carlos. With the structure of Norbert not changing much, our estimate of top sustained winds remains at 105 mph. Without significant changes over the next few hours, Norbert will likely make landfall as a cat 2 hurricane (96-110 mph). Large southwest swell will batter the coast. Swell may be 20' or more near and south of landfall. Norbert is moving nne at around 12 mph. Rainfall will pick up soon and continue Saturday. Rainfall amounts may be 5" or more. Norbert will weaken as it makes landfall but may still may be a strong tropical storm for its second landfall on the eastern side of the Gulf of California late Saturday. 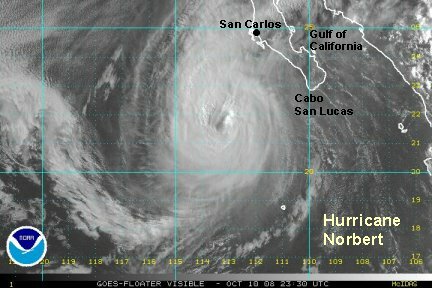 As of 7 am pdt (10 am edt) Hurricane Norbert is centered near 111.4 N / 23.9 W or just off of the Baja about 50 miles south of San Carlos. Norbert is speeding up and turning. It is now moving northeast at about 19 mph. Norbert was near cat 3 strength several hours ago, just after our last update. Since then, shear is stretching the hurricane's structure and we think Norbert is near 100 mph. Don't be surprized as the eye passes. The strongest winds currently are in the southwestern eyewall. San Carlos has been in the northern eyewall and no doubt has been getting hit hard early this morning. 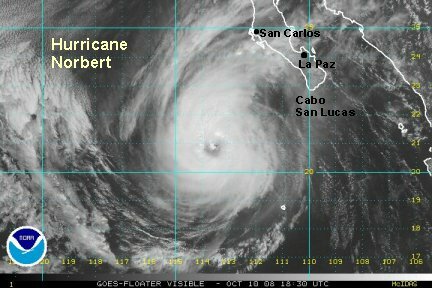 Norbert is making landfall as a cat 2 hurricane and will likely make landfall in northwestern Mexico on the eastern Gulf of Californina as a strong tropical storm or possibly a minimal hurricane. Hurricane Norbert was centered near 24.6 N / 111.3 W or roughly 50 miles east of San Carlos. 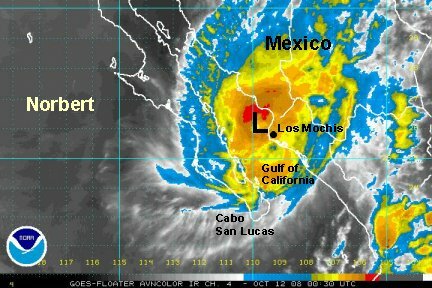 Norbert will move over the Gulf of California in a few hours. It will make a second landfall on the east coast of the Gulf of Californiia later Saturday night. Locally heavy rain is still possible with some totals in the 1-4" range near or north of Los Mochis. Deep convection is still noted so our estimate of top sustained winds is 90 mph with higher gusts. 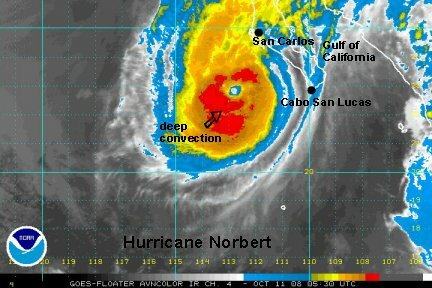 Norbert is likely under hurricane force now. NHC's last advisory had a maximum sustained wind of 90 mph. We'll estimate 70 mph at this point. It is making its 2nd landfall about 20-30 miles north of Los Mochis. Winds will die down rapidly overnight tonight. Rainfall will be the only concern after the next 12 hours. This will be our last update on Norbert.